Get your offers seen like never before. Upgrade your vehicle specials today! 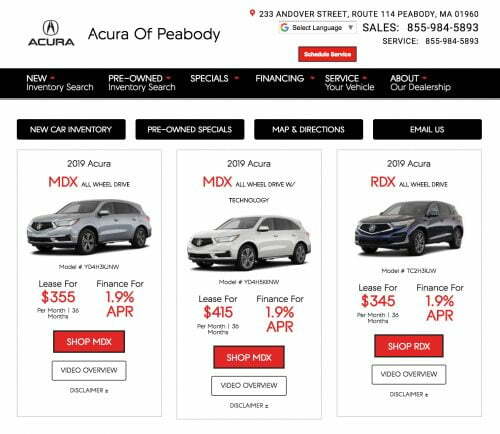 The Vehicle Specials Page increases vehicle offer engagement while providing a seamless experience on your dealership website. Plus, every specials page is video-enabled with our New Car Model Videos at no extra cost! Promote more than just your specials. Premium features that come standard. New Car Model Videos and Used Car VIN Videos are included with every install. Track results from start to finish with Google UTM tagging, and view it in your account. Dynamically link to specific videos from your campaigns and dynamically link from call-to-action buttons. Our HTML5 video player is fast, responsive, and compatible on all devices. We match the look and feel of the dealership’s website while complying with OEM branding guidelines. We take a responsive-design approach so our content looks great on every device. It’s standard stuff, but still worth mentioning. We make it easy by working directly with the website provider for a quick & painless install. No coding required by you. We’ll update your landing pages as many times as you want as part of our fully-managed service. Take Cartender for a Test Drive today!